Send Photo of Roger Lee Williams Sr.
Roger Lee Williams Sr., 84, passed into the presence of his Savior on February 2, 2016 in Mesa, Arizona. He was born in Tulsa , Oklahoma, to Edgar Roger and Mildred Alberta (Bardwell) Williams. He is survived by his dear wife, Donna, of 60 years, his children, Roger (Linda) Williams, Scott (Regina) Williams, Linda (Doug) Dueck, Dale (Shirley) Williams, Todd (Shannon) Williams, Jeannette (Mike) Clark, his seventeen grandchildren, Daniel, Melissa, Morgan, Matthew, Jill, Lisa, Tyler, Tabitha, Brenna, Eric, Philip, Nicholas, William, Lee, Anna, Joshua, Faith, and his fifteen great-grandchildren, Holden, Bristol, Jaelynne, Timothy, Abrielle, Clara, Owen, Lucas, Noah, Alivia, Kadence, Andrew, Emmaline, Isaiah, and Susanna. He is also survived by his brother Steve. He was preceded in death by his parents, and his siblings, Joyce Smith, Sunny Whan Turner, David Williams, Larry Paul Williams and many other family members and friends. Roger was raised outside Grove, Oklahoma and trusted the Lord Jesus Christ as his Savior in 1941. He went on to attend the University of Illinois before graduating from Moody Bible Institute of Chicago in 1955. He ministered as an Associate Pastor at Belden Regular Baptist Church from 1957-1960, as Pastor of Calvary Baptist Church in Menomonee Falls, Wisconsin from 1960-1970, before moving to Arizona and founding Calvary Baptist Church in Mesa where he pastored from 1970-1998 when he retired. He joked about “flunking” retirement and went back to work as a small engine mechanic, working for Gothic Landscape before finishing with Green Innovations in the fall of 2015. Over the years he served on the board at Shepherd’s Home and School in Union Grove Wisconsin. He was also actively involved in the ministries of Camp Manitoumi (Illinois), Camp Fairwood (Wisconsin), and Camp Tishomingo in northern Arizona. He led his churches through numerous building projects. 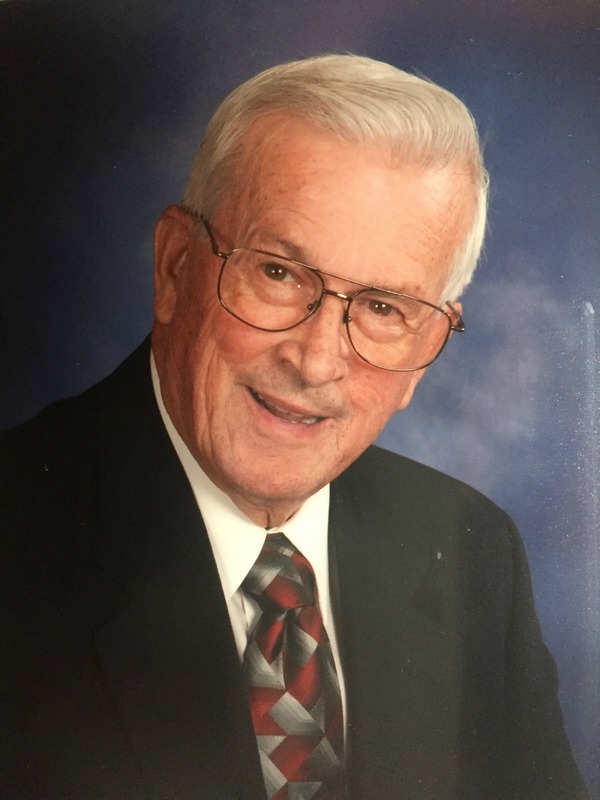 He actively supported the General Association of Regular Baptist Churches, and faithfully served in the State church fellowships wherever he was ministering. Roger loved the Lord and preaching God’s Word. He thoroughly enjoyed working with his hands, planting flowers, a good hand of Rook, and taking care of whatever car he owned at the time. Roger also liked the menu at Taco Bell, and a cold Dr. Pepper after a hot day of work. He was not a talkative man, but many people appreciated his wise counsel, wry sense of humor, and consistent example of fidelity, integrity, humility, and service. Visitation will be held on Friday, February 12, 2016 at Bunker’s University Chapel, 3529 E. University Drive, Mesa, AZ 85213 from 5-8 PM. Flowers can be sent there on his behalf. The Funeral Service will be at 10 AM on Saturday, February 13, 2016, at Calvary Baptist Church, 3810 E. University Drive, Mesa Arizona 85205, with Rev. David Swope officiating. Memorial gifts could be made to Camp Tishomingo C/O Jim Rakoci 10075 N. Scott Dr. Casa Grande, AZ 85122. “Camp Tishamingo”, is a ministry to which Roger was deeply committed over the years. The graveside service will be at Mesa Cemetery. Praying for Donna and all his children, grandchildren, great grandchildren and all his family and friends. He will be greatly missed, but is now finally with his Lord and Savior. I am thankful that God allowed me to have him for my Pastor, baptize my last child and get to be a part of his family!! I admired Pastor Williams as so many did. God bless all the family during these days of separation. Gene and I are so sorry for your loss. All of you are very special to us. We love you all. May God Bless ya through this very tough time. All of you are in our thoughts but most of all in our prayers. Will always cherish the times we were at Calvary Baptist and the times we came to visit when we were back in town. He was a very special man and will be greatly missed. It was an honor to be under Pastor Williams ministry at Calvary Baptist Church in Mesa and serve our Lord in all the ministries there. My condolences to Donna and the Williams family. We are so sorry for your great loss. We know your heart hurts for the absence of his fleshly body,but rejoice that you that are saved will be with him again one day. Those that aren’t, let his beautiful testimony speak to you and know you can have the peace that he has. His obituary was beautiful, one that made me wish I had known him. Love all the family. Aunt Janice and Uncle Harvey to Regina and Scott Williams. Hopewell, Va. I was raised in the Hickory Grove Area. Larry Paul was in my class. I’m so sorry for your loss. The Williams were a great family to know. My prayers go out to you and your family. Know he will be missed by many fond memories of him and a few of his friends holding a Bible vacation school for the youth at Hickory Grove Gym. Was the highlight of many including me. To Donna & family prayers for comfort & strength. I remember Roger Lee teaching our little Sunday School VBS at Hickory Grove – I so admired his faith & ability to preach the Word. David L. J. Laycock, Sr.
Kim and I send our condolences to the entire family. We pray the Holy Spirit will bring you comfort and peace in the day to come. Though we only met the good pastor and his wife once his gentle spirit was obvious and to Todd and Shannon we especially send our prayers and hearts. We wish we could be there for you. In Jesus Name Amen. We are very saddened to learn that our beloved Pastor Williams Sr had passed away. Cory and I have been Parishioners since we were eight years old. Pastor Roger Williams Sr Married us in 2012, we were his last marriage. He told me he was very proud to officiate our wedding. He was 81 at the time. Our hearts go out. To the kids and Donna His wife. Cory and I will cherish all the wonderful memories we had with Roger Sr. God bless until we meet again.our prayers are with y’all. One thing you never for got about when you meet, Roger Sr, he would always give you a good firm hand shake. & have a good word for you, wither it be from the word of God or a funny joke to make one laugh & put a smile on ones face. I appreciated his kindness & faithfulness in n’t being ashamed of the Gospel or who he was, in what only Christ could do for one alone, in bringing reconciliation into ones life, as their is no other means outside of Christ alone. What a friend & savior Christ is, for none are worthy to be recipient of His grace, as it’s utterly amazing grace to be identified in Christ saving grace, for Heaven would have none if Christ didn’t seek after the fallen first amen.